This meme wins the internets today. Hands down. Yeah, hands down, just like the hands of too many US Senators are down in their pockets rather than over their hearts. My hand has repeatedly been covering my mouth or covering my heart this last week while visiting the Internets. Moments of shock and sadness at what idiotic things people will write, share and post in the name of "safety" and "protection". Nor does it provide any measurable amount of "safety".... And what is it you truly need protection from??? What these things do provide is a means with which to kill, mame and do serious harm to other living beings. If those are ideas that make you feel safe - you know, death, blood, trauma.... Then you probably score pretty well on a psychosis exam and SHOULD NOT have access to anything that will allow you to enact your backward, pained reality on the world. 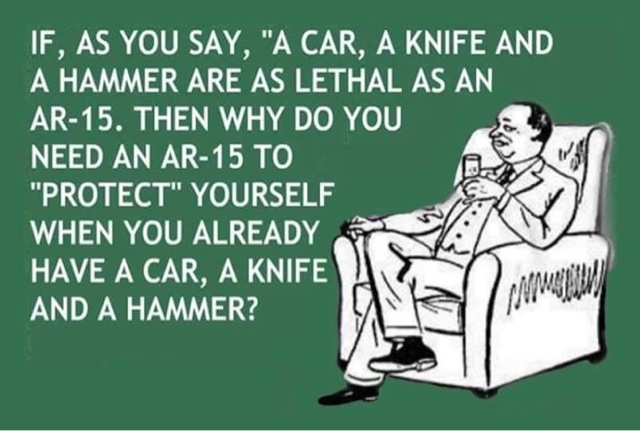 Aberator our ... And Awaiting the time when Americans stop blasting about our oxy-moronic views and start using reason, logic and above all that.. Love, to find the best definitions of Safety.